Just like last years, only better. 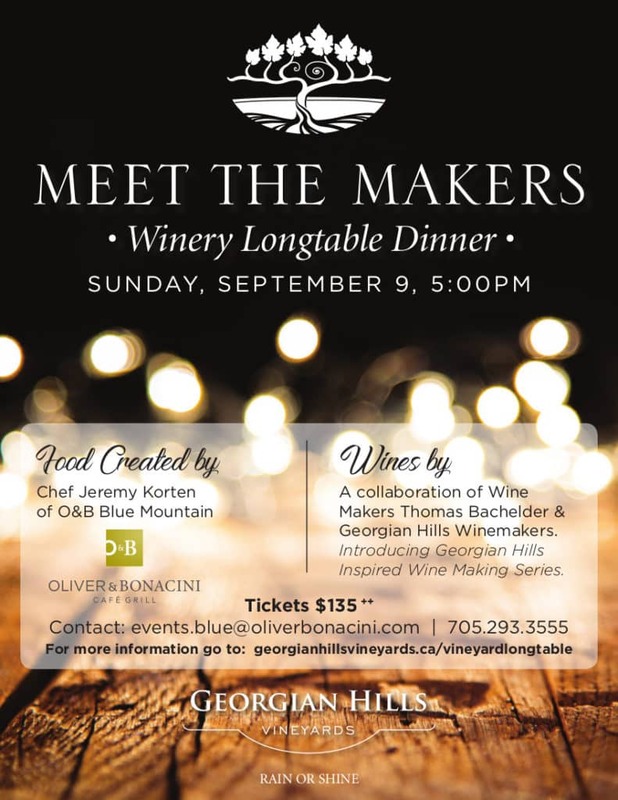 After a hugely successful inaugural event in 2017, we’re thrilled to announce the return of MEET THE MAKERS, A Vineyard Longtable Dinner. Imagine yourself sitting in our Vineyards, while dining on a sumptuous 5-course dinner, with a tantalizing wine pairing. Food created by Chef Jeremy Korten of Oliver & Bonacini Blue Mountain. Wine crafted by Thomas Bachelder, and Georgian Hills Vineyards’ Winemakers. Please be advised this is an intimate event, thus there is a very limited quantity of tickets available.